According to the Health Resources and Services Administration (HRSA) the demand for nurses in the United States is expected to rise by 2020, making the career field a desirable and lucrative one. Since health and medical assistance will certainly not go out of style, investing in training and certification to become a nurse is a highly logical plan. Nurses have access to many benefits including health and medical coverage, vacation time and excellent annual wages. The mean annual wage for a basic nurse is roughly $52,000 a year, and specialize nurse close to $72,000 a year. Nurses are able to work in many different specialty niches and career settings. From hospitals to private practices, government agencies to schools, home care facilities and more, the possibilities go on and on. Nurses can often expect flexible hours and work schedules, as they possess the ability to take up shifts as desired. Shifts usually range from between four to twelve hours, meaning nurses can opt for the best shifts to accommodate their schedules. Nurses may be able to work part time and perform duties as one of two jobs or educational opportunities. Registered nurses are able to take proactive steps through their work and make a huge positive impact in people’s lives. Through compassionate care and assistance, nurses are often described as the ‘guardian angels’ to patients. It is for this reason that a career in nursing can be particularly gratifying and satisfying. Nurses are able to reach patients on their level, interact with medical staff, doctors and administrators in a way that expands their knowledge of the world of medicine and helps them form a better grasp on the industry as a whole. Through analyzing the world of medicine from both sides, nurses have many opportunities for career advancement and learning on the job. No two days are the same for those working in the nursing profession. The job is ever exciting and challenging and requires nurses to act swiftly and accurately. •	Help individuals learn to self-administer necessary medications and educate about other home-care tasks. Depending on the type and level of care provided, registered nurses may work in a wide range of settings. As stated by a 2014 report by the U.S. Bureau of Labor Statistics (BLS), most nurses will work in hospitals, private physician offices, home health care clinics, government offices or branches, and nursing home facilities. Urgent care clinics or hospitals often require nurses to work evenings, holidays or weekends. Facilities that remain operational 24 hours a day and on every day in the year have a growing need for qualified nursing professionals to remain on call and ready to work on very short notice. The field is exciting, challenging and requires some degree of stamina and flexibility no matter what the specialty niche. Nurses may also assist in running clinics or carrying out educational seminars and blood drives. Physician’s office nurses, in contrast, may work a more regular and lenient schedule. The education and licensing process for becoming a registered nurse may vary depending on where one hopes to enter the field. An associate degree is usually the minimum required certification, taking roughly two years to complete. A bachelor’s degree, which takes roughly four years, will include additional medical training and potential clinical training programs in non-hospital environments. Such training is usually a great boost as hands-on experience is one of the most beneficial ways to quickly acquire and interpret medical knowledge and learn clinical practices. In contrast, nurses who seek a higher-level job or credentials in medical research, administration or consulting are encouraged to pursue a master’s degree. One of the most beneficial accelerated master’s degrees to obtain to work in such fields is a Bachelor of Science/Nursing credential, bundled with health/medicine-related master’s certifications. Once the necessary degrees are completed, aspiring nurses are required to pass an NCLEX-RUN exam or national nursing licensing exam. After becoming a registered nurse (RN), one can take steps to decide their career path through the pursuit of professional or specialty jobs related to a certain niche within the world of nursing. Depending on one’s certification and personal preference, one can apply for jobs in various work and medical practice settings. Work settings usually include a specific type of facility such as emergency room, rehabilitation center or cancer treatment facility. No matter what the care setting, nurse objectives always involve being attentive and caring towards the well-being of all patients. Long-term career prospects for registered nurses are excellent. For this career in particular, the time and money necessary to devote to educational certification and licensing exams reaps incredible rewards. Registered nurses are required to finish at least two years of formal education past a high school diploma and acquire licensure by the state they plan to work in. Though the health industry is experiencing change and fluctuation, the Bureau of Labor Statistics projects a growth of roughly 16% for the nursing profession between the years 2014-2024. Average annual wage for registered nurses as of the year 2015 was $71,000 making it a highly desirable and profitable career with many opportunities for career advancement. 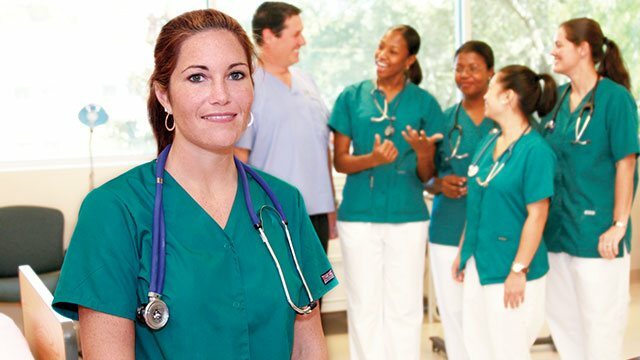 Through gaining knowledge and insight in the world of medicine, registered nurses are excellently situated to apply for higher paying interrelated jobs, network with professionals in the field, go to work for different or multiple organizations, and obtain additional certification and training necessary to become a specialty nurse or registered doctor.